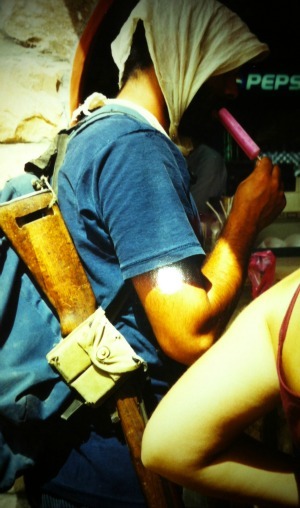 One of the gunmen who protected us eating a popsicle. There was a time in my life when I believed I would keep track of Israel, stay up to date on the news halfway around the world, think about how the daily turmoil affects those who live in the threat of constant danger. Israel is the land of my people, the home of a few of my relatives and a significant symbol to those who cherish it and to those who hate it. It was an incredible time. We had just graduated from college, and we went with two other friends (and several bus-loads of others just like us) to experience the culture, the beauty, the history and the importance of this country. We made friends that we’ll always remember fondly, we explored a country and culture we had never experienced, and we felt a sense of pride that we were visiting a dangerous land so our lives could be enriched. I’m not a religious man, and this trip didn’t make me any more so (though the first time I touched the Western Wall, I felt a surge of spirituality ripple through me that I’d never felt before and have not felt since). At the end of the trip, as we sat on the beach of the Mediterranean, the group talked about its post-Israel goals and what we had learned from traveling the country from Tel Aviv to Jerusalem, from the Red Sea to the Dead, from the desert to the big city. I declared that I would follow the world of Israel from afar through newspapers and websites. I believed it was important that knowledge of the region would somehow make me a better, more informed Jew. That knowing what was happening in Israel would make me a better global citizen, a better person. Naturally – and I probably could have predicted this at the time – my interest in Israel has wavered. I don’t keep up to date with the latest micro-conflicts. I know who the prime minister is and what American commenters think of him, but not much else. This doesn’t make me a lousy Jew. It just makes me less informed than I once thought I should be. 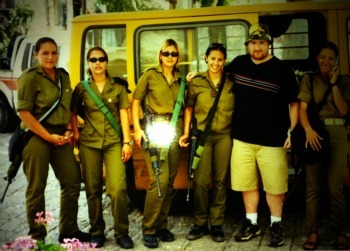 These Israeli soldiers could have destroyed me. There are waxes and wanes for the fighting that occurs in that holy land, and when we there in 2001, it was a relatively peaceful time. A day after spending our evening in the Russian Compound neighborhood in Jerusalem, though, a car bomb exploded there. A few weeks after we returned to the U.S., a Tel Aviv nightclub was blown up. We were told never to ride the buses while in Israel, and we were not allowed to visit any of the street markets. The danger never truly fades away. Now that the conflict has begun again between Israel and those who want to destroy her – and the danger becomes a daily obstacle of life – I think of my relatives who live outside Tel Aviv and I wonder about their daily lives now that the bombing, the missiles and the fear have returned. I sent my relative a message the other day via Facebook, and here was his entire response. It is, in my mind, beautifully-written and eye-opening. Thanks for writing. I’m grateful for your concern. The situation is a little worrying but could be much worse. We are located in the Sharon region which is outside the 40 km radius around the Gaza Strip which has been bearing the brunt of the attacks. It was pretty shocking that over the weekend, rockets were fired into Tel Aviv and Jerusalem. These targets have not been attacked in many decades, and Tel Aviv is much closer to us, and a reminder of our vulnerability. Of course, the people who do live in the 40 km radius (in major cities such as Be’er Sheva, Ashkelon and Ashdod) have been experiencing living hell for 12 years now, and a particular acute form of it over the last week or so when about 700 rockets were launched, each with mass-casualty-causing potential. Now, we who live in the center of the country are exposed more directly to the same terrors, though at a much lesser intensity. For the people in the South though, the terror is much more real. The missiles are landing in their cities and blowing up their apartments. I have a personal connection to the most serious attack which took place on Thursday where a rocket struck the fourth floor of an apartment building killing three people in the town of Kiryat Malachi. I was in Kiryat Malachi last month and had a meeting in a cafe a few blocks from where a rocket landed. Everyone I know has the radio on almost 24/7 and at some times actually 24/7. Over the Sabbath, when those who are religiously observant do not operate electronic devices, I set up a radio in the corner of the apartment at a minimal volume so that it wouldn’t disturb our Sabbath experience but from which I could glean news updates when I got close and leaned my ear into the speaker. I’m at work now and am watching the TV which now is being broadcast 24 hours a day on the internet. The broadcast gets interrupted every 10 minutes or so with the presenter announcing in a panicked voice “Alert in Ashkelon. Alert in Ashkelon (or whatever the city the missiles are travelling to)” and the air raid sirens are sounded. Then the broadcasts switches from the studio to live feed from the border with Gaza and in real time you see the missiles taking off from Gaza and hurtling toward Israeli cities. One gets a very cold, life-draining jolt, viewing these projectiles, knowing that they are on their way to destroy lives, but not knowing on whose heads they are going to land, and possibly those of you and your family. As I am writing these words, the broadcast switched to show rockets on their way to Tel Aviv. There was a large call up of reserves on the night between Friday and Saturday. Again, this had particular challenges for religiously observant reserve soldiers who don’t answer the phone on the Sabbath. There was an eerie feeling on Saturday morning when I was in synagogue and didn’t see several of my friends who prayed there with me on Friday night. After the service, I asked their wives what happened and they said that in the middle of the night, they got phone calls (which they never receive on the Sabbath) and when the phone kept ringing, they decided to answer. Although Sabbath violation is one of Judaism’s most serious sins, it is a commandment to violate the Sabbath to preserve human life and being called up to defend the country is considered preserving human life. The army sent buses and before the sun was up, my friends were driven out to their staging areas in different parts of the country. In my family, there has been a lot of anxiety, despite our attempts to spare our children from the reality we face. It’s difficult to do since we’re tuned in to the news for so many of our waking hours. I’ve taken to walking around the apartment with a radio in my pocket and one earplug in my ear to keep up to date and not unnecessarily worry my family. On the first day of the war, I asked my wife to keep the kids close to home and that evening we did a missile drill where we descended from our fourth floor apartment to the stairwell of the second floor, which the home front command notes is the safest place to be. My middle daughter is anxious about many things and predictably, the situation has brought out many of her latent fears about our enemies trying to kill her. My youngest daughter, who usually is sangfroid about everything, pleaded to be able to stay in our arms. My wife told her (somewhat disingenuously) that there’s nothing to worry about but she replied, “I know mommy, but my heart is beating so fast, and I’m just scared.” My older daughter, who has a better understanding of history and realpolitik, muses about whether this was what it felt like to be a Jew during the Holocaust. I tell her (not disingenuously) that this is nothing like the Holocaust, but at 13, and with rocket alerts on the screen every fifteen minutes, I can’t expect her to be sensitive to the differences. There is a lot of anxiety and tension about what happens if and when the sirens go off in our city. First of all, unless it’s Saturday, it’s likely that we will all be in different places. My two younger daughters are in the same school, but my oldest daughter studies in another city and my wife and I work in two different cities. In addition, in the event of an attack, the city’s security forces will likely be called to other places and in the context of my police service I will be called up to command the city’s western police precinct. My wife and children are not appreciative of the possibility that I will be out of the apartment and dealing with the general safety of the city’s residents rather than being in the 2nd floor stairwell with them. There are a few bright spots in an otherwise frightening reality. On the first day of the war, the air force knocked out about 100 long range rockets whose range would have allowed them to hit our area. This was a remarkable feat because the rocket silos were placed in crowded Gazan neighborhoods a dozen yards or so from mosques, playgrounds and schools. It takes a remarkable amount of precision to hit the rockets and not the civilians. So far, I’m grateful and full of awe, that only 30 Gazans have been killed, and most of them I believe are Hamas militants. Another source of wonder is the iron dome rocket interception system developed together with the U.S. These anti-missile missiles have successfully intercepted over 80% of the incoming rockets. It’s the only such system in the world and we’re grateful for it. It’s the reason only 3 Israelis have been killed so far, despite the nearly thousand rockets they’ve shot at us. Thirdly, there is an amazing sense of unity and kindness that comes out during these difficult times. Our community is hosting a number of families from the South, giving them a break from the hourly need to run to the shelter. People are increasing their good deeds and charity giving. Bitter political arguments that usually characterize our society have been put aside. In general, there’s a kinder, more loving tone in every day interactions. Thanks again for your concern. I hope my letter finds you well and gave you some insight into our experience. No matter what side you’ve taken, know that there are hundreds of thousands of people — Israelis and Palestinians — who live this life every day. One day before Thanksgiving, here’s hoping that some day all of them can find peace.